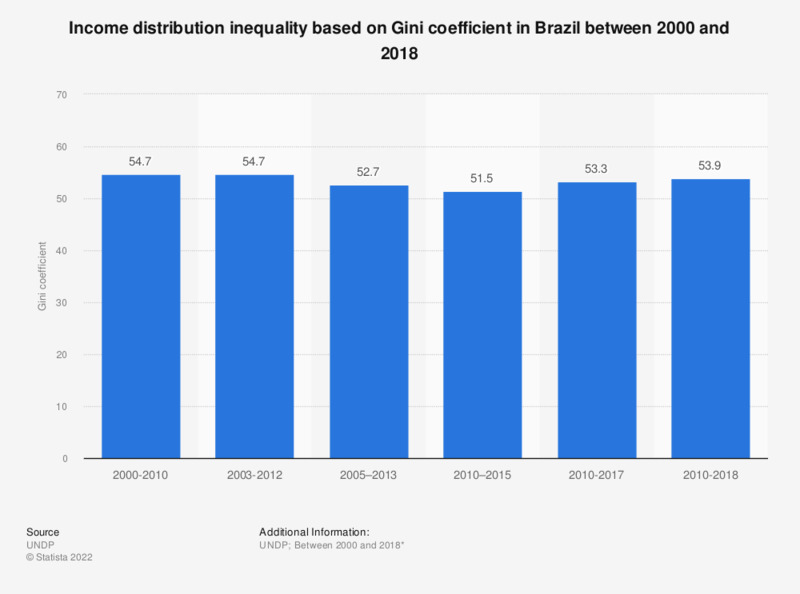 This statistic depicts data on the degree of inequality in wealth distribution based on the Gini coefficient in Brazil between 2000 and 2017. The Gini coefficient measures the deviation of the distribution of income (or consumption) among individuals or households in a given country from a perfectly equal distribution. A value of 0 represents absolute equality, whereas 100 would be the highest possible degree of inequality. As of 2017, Brazil was deemed the most unequal country in Latin America, with a Gini coefficient of 51.3. However, wealth distribution has showed signs of improvement in Brazil, with the Gini coefficient decreasing consistently since 2012. * The source does not specify the exact date of survey for each year. According to the source, the data refers to the latest figure available in the indicated time periods. This statistic was assembled using different editions of the UNDP's Human Development Reports, namely 2013, 2014, 2015 and 2016, and UNDP's Human Development Statistical Update 2018.